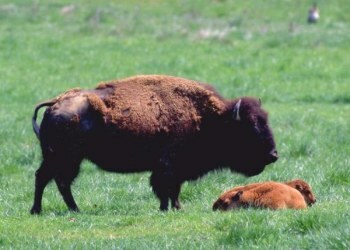 Wildlife Prairie State Park has often been referred to as a jewel in the Midwest. Located just outside of Peoria, IL, this 2,000-acre zoological park is home to over 150 animals; that's 50 different species that are native to Illinois. Our guests come to learn about wolves, bison, waterfowl, black bears, elk, cougar, otter and much more. You will enjoy the park's spectacular natural landscape, our many avenues of recreation: hiking, biking, fishing, and lodging, and a train ride, too! Plan your visit today...an adventure awaits! "Named as TOP 10 things for families to do in Illinois" by Trekaroo- Spring 2013. 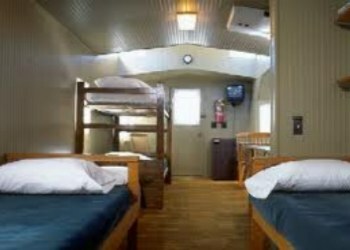 The train cabooses are located on the edge of the Bison and Elk range and sleeps 4 people comfortably PLUS additional foldout beds for more. These beds are single style bunk beds. 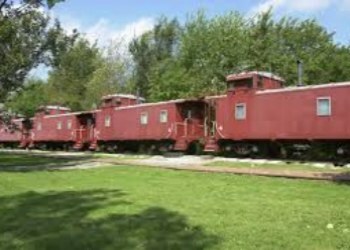 These cabooses also have a small refrigerator, coffee maker, microwave, air conditioning and are available April thru October. Our overnight lodging is as unique as the park itself. We have many options that will enhance your getaway. All of our lodging guests have access to the recreation room and extended fishing hours. In the 1960's Bill heard that the Brookfield Zoo was looking for space to raise exotic endangered animals. Coincidentally, the Forest Park Foundation, a foundation that his family has run since 1939, had acquired 480 acres of land (including abandoned strip mined land) near Peoria with the intention of using it for conservation and environmental purposes. The Foundation thought its land was the answer and Brookfield agreed. Later the management at Brookfield Zoo changed, as did their plans for the Peoria development. Since the Foundation had already started planning for the Zoo's project, it decided to create its own project. Something the Brookfield's and Lincoln Park's of the world could not do. Use an untapped natural resource to pay tribute to America at the time of the pioneers and establish a zoological park dedicated to Illinois. Over the next three to four years, native Illinois animals (and those brought by the pioneers) and plants were acquired, construction materials were secured, buildings were erected and money was raised. Bill often remarked, "The head of the Peoria park system said to me, 'Bill, if you do the things you're talking about it will cost you a million dollars.' And I said 'It can't. I've got the land, most of the fences and the entrance road.' Well, so far it has cost me $17 million." The park officially opened in 1978 and was independently operated until September 5, 2000 when, our founder, William Rutherford Jr. presented the deed to Wildlife Prairie State Park to Governor George Ryan and the State of Illinois. Shortly thereafter, Wildlife Prairie Park became "The Hazel & Bill Rutherford Wildlife Prairie State Park."